Courtney Craven, the daughter of Brian and Amy Craven, is the Rotary Student of the Month for October for the Corinth School District. She is the granddaughter of Jerry and Betty Nixon of Corinth and Paul and Dee McClay of Fulton, Kentucky. In the area of academics, Courtney is ranked second in her class of 140 with a GPA of 4.20 and an ACT score of 29. She has earned the Advanced International Certificate of Education (AICE) Diploma with merit through Cambridge. She has received awards in AICE Chemistry, AICE Pure Math I & II, AICE Global Perspectives, AICE English III, Theatre I, Spanish III, AICE General Paper, AICE Thinking Skills/Problem Solving and IGCSE Chords in Physics and US History. Craven was proud to represent Corinth High School at the Rotary Youth Leadership Conference in Olive Branch, MS. She was named a finalist in the ACE Power Leadership Program and was honored to serve as a Page in the Mississippi House of Representatives for Rep. Nick Bain. Courtney spent time this summer learning about art, language and culture in Courtney represented the Corinth High School Golf team at the State tournament the last two years receiving 3rd place last season. She represented the Mississippi Junior Golf Association as team captain at the Southern States Junior Golf Tournament at The University of Oklahoma’s course in Norman, Oklahoma and Dalhousie Golf Club in Cape Girardeau, Missouri. She has played in many golf tournaments throughout Mississippi and Tennessee including The Ole Miss Golf Course, Old Waverly, Tupelo Country Club, Kirkwood National, Meridian Country Club, Greenwood Country Club, Patrick Farms and Deerfield Country Club. In addition to golf, Courtney really enjoys being a Diamond Girl for the CHS Baseball Team and participating in the Leadership and involvement in a variety of activities have helped Courtney to become a well-rounded student. She was secretary of the Mayor’s Youth Council and was involved in Junior Leadership Alcorn County. Her clubs include National Honor Society (sweetheart), Academic Team, Student Council, Science Club, Pep Club, Mu Alpha Theta, Key Club, Interact Club, Historical Society, Foreign Language Club, FCA, Thespian Society, Environmental Club, Drama Club. Within the community, Craven is very involved at First Baptist Church and has worked with VBS for several years. She is employed at Ginger’s Boutique and volunteers at Magnolia Regional Health Center. She has also volunteered her time at The Lighthouse, Amen Food Pantry, Coke Race, the Commission on the Future of Alcorn County events and several Corinth school events. One of her favorite mission projects was volunteering in inner city Chicago neighborhoods with low income children and helping renovate a fire station into a church building. Another meaningful experience was teaching a Vacation Bible School class to children who were recovering from the devastation of their homes by Hurricane Katrina in Pearlington, Mississippi. She has also participated in several mission projects in inner city Nashville. 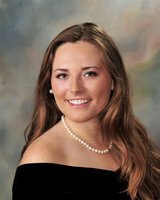 Courtney has been accepted into the Patterson School of Accountancy at the University of Mississippi where she plans to major in accounting and minor in real estate.